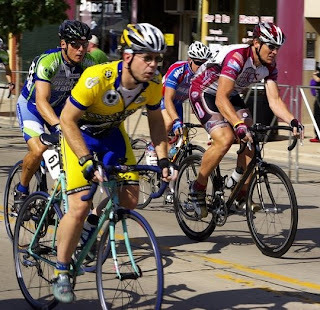 Another criterium season winds to a close with the venerable National Championships Weekend in Downers Grove. 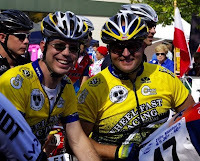 Wheel Fast Racing was ably represented by myself and Chris Hammer racing Masters 30+ 4/5. With the race not until 4 in the afternoon, I had a lazy morning, getting the Bianchi ready, putting a 25T cog on my sew-ups and figuring that with the hill, light wheels would trump aero. Chris and I discussed taking an amble around the course to scout out new potholes and just re-familiarize ourselves with a course that is lined with great and terrible memories. I quickly discovered that between corners 7 and 8 of the 8-turn mile long circuit that a wind tunnel occurred and after we registered I headed home to switch to the Bontrager Race Lite wheels. I know the hill on Summit is not a long climb, but I also knew that my power is a bit suspect and thought that hitting the 53x25 every lap would allow me to maintain speed with a good cadence and not waste a lot of what little power I could put to use. Now racing a 14 year old frame with 11 year old Campy Chorus bits in what is my favorite race seems perhaps counter-intuitive, but without worry I knew I could put my bike in any hole. I realized at the completion that this old bike melted away underneath me and I was focused on racing smart without a second thought, so attuned to the bike that it was simply an extension of my will. I know it sounds perhaps cliché, but it was true on Saturday. I never gave a second thought to the bicycle beneath me. Our warm-up went great. Chris pre-softened his tire on my patio, a story I'll leave to him, but we worked up through our heart rate zones and got the sweat pouring. Chris indicated that he wanted to put in a hard effort at the beginning of the race. I thought to myself, that's great, I just want to finish with the field. Lofty goals. Actually, that isn't fair. I had several goals for the race: stay near the front early, expend no energy on the climb, stay near Chris, and finally make it to the finish with the leaders. Chris and I joined the field of 75 and ended in the third row at the start. Neither of us was pleased, but on the right hand side I knew we could make a jump and hopefully get up quickly. After posing for pictures that Stephen and Kim were taking, the official gave instructions, and we set out. Chris and I both got a good jump and we were right up at the fron t of the race. Fantastic. Now to maintain it. We turned the first lap at a rapid clip. I headed through 8 to the roar of my personal fan-club. Thanks to Stephen & Stephanie, Mom & Dad, and Tim & Maddie for showing up to cheer. Coming up the street I could hear Kim giving Chris and I plenty of encouragement and taking pictures. As we continued we picked up the cheers of Scott and John. I know Laura, Matt and Chris' mom are out there pulling for us, too. It was great! True to his word after a lap or two Chris went up and put a monster effort in, pulling free with two riders that found they couldn't match his horsepower so soon in a race and quickly were back in the field. I'm sitting about 6th wheel for the Chris Hammer show. Should I ease off and let a gap open? I knew it would be tough for me to try and control the front much and I made a quick decision that rather than drop back and give up position I'd just watch the show. For the next lap and a half or so, the crowd was treated to a beautiful view of Chris' yellow & blue Bicycles Etc. shorts as his legs drove on his Easton EA70 wheels sparkling in the afternoon sun. We were going single file, tongues out, but the great thing was that being at the front we weren't touching brakes in the turns and I wasn't having to accelerate as heavily. It was great. Kim said that the announcer gave Chris some much deserved love on the PA. Finally we catch Chris. As he drifts on my right side I give him some encouragement and he slots back in. Fantastic. We continue to speed around the course, Chris and I never leaving our spots near the head of the pack. It was tough, I'll be honest when I saw that only 13 minutes had elapsed I questioned whether I'd indeed see the end, but I hung tough, finding Chris' backside my target – don't leave Chris. We did have a good wreck. For Marky Mac & Tire I will recount that on Summit a guy somehow touched a wheel or did something else foolish and hit the deck. His head landed by my right pedal and I heard the smack on the ground has his helmet collapsed, saving his brain long enough for him to get run over from behind, the riders bunching in as the front slowed up and over the climb. I heard the grunt as body went over body and instinctively, as any criterium veteran knows, punched it. We made the left hander onto Main Street and dropped down the hill at a dizzying pace. I only saw 33.1 as a max, but it might have been here. However, the field didn't split. What I don't clearly remember is whether the next break was away at the time of the wreck. Two guys got down the road, maybe Lot and Tower Racing?? I don't quite recall and will rely on Chris' photographic memory to fill in that detail. They got maybe 50 meters and sat out there for awhile, but the guys at the front didn't view it a large threat. I continue to hear Stephen from the sidelines in my ear admonishing me to “stay up there.” We are hitting the corners pretty hard now and sometimes are finding 4 riders abreast. It is a bit scary, but everybody is riding pretty smoothly and nobody is taking chances near me at least. I see 3 laps to go and realize that my little goals are turning into reality. Chris and I are still near the front and I'm not completely spent. I'm a bit stunned after nearly being the veritable Lantern Rouge, or for those that aren't cycling fans per se, the last official finisher, of Chicago and Elk Grove. We roll through for the bell. 1 lap to go. 1 mile more. It is three lines of riders streaming up Main Street and Chris and I are right in the middle. Suddenly, the rider in front of Chris backs off the accelerator. What the heck? We lose spots. Crud. We were sitting pretty with one lap to go and now are facing probably 25 riders ahead in the blink of an eye. That's bike racing for you. One moment you're on top of the world, the next your back's on the asphalt staring at a blue sky. With nothing else to do, we charge onward trying to regain some position. The descent is screaming and it is impossible to move up. The four final turns are a blur. We exit through 8 and I hear my fans, shift and sprint. Chris is right ahead. We're definitely outside of the Top 10 which is a bit disappointing, but I achieved every goal I set out to achieve and so that disappointment is very short lived. I'm still in the front half of a strong field, I kept the bike upright, and I didn't embarrass myself in front of my fan club. I catch up to Chris on our cool-down lap and we chat briefly about it as our heart rates drop out of the clouds. I head over to chat with my fans, everybody is really excited. I'm pretty thrilled with the outcome. It is always nice to have a good ride on my home streets. I still don't know what my official place was for the race. We averaged about 24.5 mph for a touch over 30 minutes. I spent half that time with my tongue definitely hanging out when I checked my HRM – 16 minutes with the heart doing 3 beats a second or faster and 15 minutes with it doing slightly less, for a race average of 171 BPM. About right on for this distance. We head back to my house with Scott & John meeting us and enjoy the wonderful post-race recovery drink provided by our friends at Two Brothers Brewing in Warrenville. Chris finds his favorite “Dog Days” while I enjoy a “Bitter End”. The only thing I found bitter in the day is that my fitness is finally arriving as the season closes. Downers Grove is inexorably for me the end of Summer, that sign that it is time to head back to school, for indeed it once symbolized that back in the early 90's when I first discovered Downers Grove as university student in Urbana. It is a bitter-sweet weekend for me. I know there are good days ahead and more miles to be spent on the bike with my friends, but the days are already getting shorter. I know we'll be watching the leaves change in Argonne before we blink. I would be remiss without giving one last plug to our fantastic sponsors. First, Brian and the entire team at Bicycles Etc. do an excellent job keeping our bikes and wheels rolling. I've raced two different bikes and four sets of wheels without issue this season and that is in no small part due to their skill. Our meetings would be far less fun without the sponsorship of Two Brothers Brewing. Thanks to Jim, Jason and Gabe and the whole crew there that keep us well hydrated. My Giro helmet kept my head safe while my Easton wheels were a dream to ride. The chains stay lubed with Boeshield and the yellow Oury grips complement my WFR-blue mountain bike, shod with Kenda tires. I know there is a difference of opinion on our shorts, but the Voler kit in bright yellow & blue makes it pretty darn easy to find Chris in a crowed field. It is an expensive sport and the sponsorship of these terrific people keep us rolling. Finally, a photo credit for some of the images in this post to John Wrycza. Visit www.wrycza.org for more fantastic images! Hopefully I'll check in another time or two this fall, but otherwise, after a couple of years of not racing as much as I'd hoped due to a variety of events, I'm happy to be back going fast again and thrilled that 08 ended on a very high note that will carry me into 2009. With the new Masters 4/5 appearing more and more on the schedules, I'm really excited about racing next season and really excited about the prospect of having Stephen re-join us. Now that it has taken longer to summarize the race than it took to race, I'll draw this to a merciful close. Thanks to all of you reading this for your friendships and support.